Even though some virtual security experts identify Go.next-search.net as a malicious browser hijacker, our researchers have not found this threat to corrupt browsers without permission. Needless to say, if this is something you encounter, we would appreciate it if you warned other readers about this by posting a comment below. Needless to say, an intrusive browser hijacker requires immediate removal, but you need to delete Go.next-search.net even if you have installed this search tool yourself. We have tested this threat, and our findings are presented within this report. If you have any questions after you read this report, do not hesitate to post them in the comments. Our research team has found that Go.next-search.net is identical to Trovi.com and Trovigo.com. Both of these unreliable search engines might be identified as browser hijackers as well, and we also advise removing them. If you are interested in deleting these search tools, you can enter their names into the search box to find an appropriate removal guide. Luckily, it is unlikely that you will need to delete these search tools if you are stuck with Go.next-search.net. The bad news is that you might have to remove Go.next-search.net-related infections and undesirable programs. For example, you might have to delete such potentially unwanted programs as MyPCBackup or One System Care and adware (e.g., PriceFountain). It was found that Go.next-search.net can be dropped by third-party installers, and Search Protect is often bundled with it. This tool protects Conduit settings, which is why it is suspected that Conduit Ltd. has some sort of control over Go.next-search.net. Even though the creator of this search engine is ClientConnect Ltd., it is possible that Conduit is a partner of this company. All in all, regardless of the creator, you should not interact with this search provider. If you have not deleted Go.next-search.net yet, chances are that you have used this search tool for web surfing. Even though this search tool redirects to Yahoo Search pages, there is a great chance that the search results will be influenced by the unreliable search tool. Have you noticed Go.next-search.net representing banner ads and sponsored search results? Even though some of the ads and links might be harmless, others could promote malicious installers and redirect you to dangerous sites, which is the main reason to delete Go.next-search.net. Even if you refrain from clicking on suspicious advertisements, the cookies installed along with this search engine will continue spying on you. Do you know why this can be dangerous? If you do not remove these cookies quickly, they could leak data about your operating system and your browsing behavior to undisclosed parties. Schemers might use this kind of data for malicious scams, which is why their removal if imperative. Even though Go.next-search.net does not look harmful, it is not a search engine you should trust. Our malware researchers recommend trusting automatic malware removal software to delete all malicious files, cookies, and other components that belong to this search tool or the associated infections. Of course, you might have to remove Go.next-search.net or apply the preferred search tools manually, which is why we have prepared this manual removal guide. 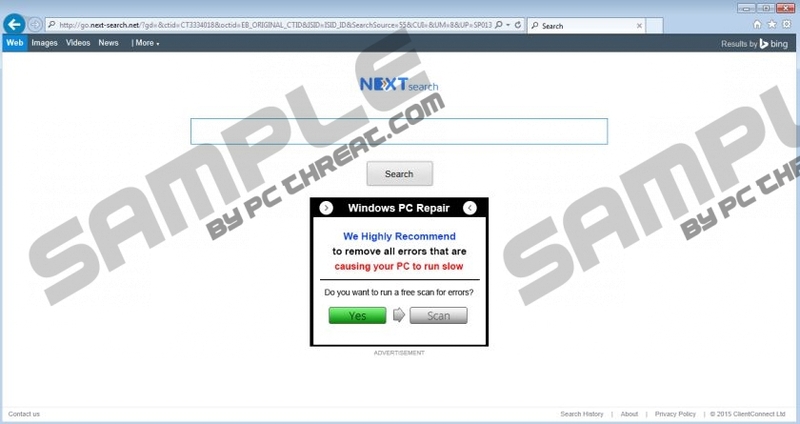 The first removal step will help you delete Search Protect and possibly other undesirable programs. Click Start on the Taskbar to open the Start menu. Open the Control Panel menu and move to Add or Remove Programs. In the Change or Remove Programs menu select and Remove the undesirable programs. Click the Windows logo on the Taskbar to open the Start menu. Right-click the undesirable program you wish to delete and choose Uninstall. Launch RUN (tap Win+R), enter Control Panel, and click OK.
Identify the program you wish to delete, right-click it, and choose Uninstall. Open the browser, simultaneously tap keys Alt+T, and select Options. Click the General tab, remove/change the Home Page URL, and click OK.
Move to the Firefox search box on the right and click the Search icon. Open the browser, simultaneously tap keys Alt+T, and select Manage Add-ons. In the menu on the left select Search Providers and set the preferred search provider. Simultaneously tap Alt+T one more time and select Internet Options. Click the General tab and remove/overwrite the undesirable Home Page URL. Launch the browser, simultaneously tap keys Alt+F, and select Settings. Navigate to the On Startup section. Overwrite/remove the URL representing the undesirable search tool and click OK.
Navigate to Appearance, select Show Home button, and click Change. Move to Search, click Manage search engines, and set a new default search provider. Identify the search tool you wish to remove and click X on its URL. Click Done and restart your computer. Quick & tested solution for Go.next-search.net removal.